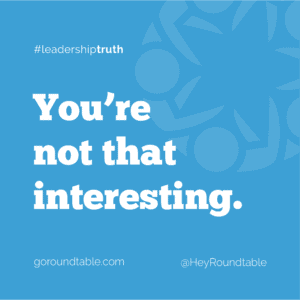 #leadershiptruth - You're not that interesting. How many of us mentally carry around stories about what we think other people are thinking and feeling about us? How much time have you spent ruminating over situations where you felt embarrassed or had a big misstep? Bonus points if that situation happened more than 10 minutes ago. I’ve noticed that many of us are really good at worrying about what other people might be thinking about us. We ruminate over the situation and then think that others are giving it the same amount of attention. How much time do you think the people who saw your embarrassing situation are thinking about it? Survey says: not so much. I’ve had many people bring up their embarrassing situations to me and I’ve had to pause to try and remember them. Many times, I can’t ‘cause here’s the thing: you’re not that interesting. I’ve got my own embarrassing situations that I’m ruminating over thank you very much. I don’t have time to remember all of yours. Most people are too busy living their lives to remember that you tripped on the stage or flubbed someone’s name or had a rip in your pants unless you keep bringing it up (or get turned into a meme that circulates on social media like John Travolta). Here’s the thing: if you’re spending huge amounts of time worrying about others, it’s time to let it go. Other people aren’t worrying about you. They’re too busy worrying about what you think of them to give your embarrassing faux pas more than a second thought.